King Duncan shares this story: “A substitute Sunday School teacher couldn’t open the combination lock on the supply cabinet. So, she went to the pastor for help. The pastor started turning the dial of the combination lock, stopped after the first two numbers, looked up serenely toward heaven, began moving his lips silently, turned to the final number, and opened the lock. What was Abraham thinking when he looked up at his knife before striking his son? They didn’t have tape in those days, but they did have angels. Angels did what tape on a ceiling does for us. They gave important messages. Sometimes, those messages meant life or death. The emotional impact of the story of the sacrifice of Isaac is lost by just reading the story itself, in isolation to the greater Abraham story. 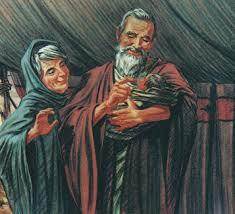 Abraham and Sarah struggled to have any children. In fact, they gave up hope. This in spite of the fact that God promised them descendants who would be too numerous to count. Though Abraham is depicted as having faith in God, there is, perhaps, a sense of Abraham hearing God repeatedly promising all these descendants that it just got old. So, Sarah gave Abraham permission to lay with her servant so that there would be someone to receive their inheritance. Ishmael was the product of that union. Sarah became jealous and had Abraham cast them out. Arabs claim Ishmael as their ancestor and their connection to Abraham. When God promises them a child to come in a year’s time, Sarah laughs at something to preposterous for this to happen this very old couple. That’s how Isaac got his name. Now God orders Abraham to take this son of theirs, their only present heir, because Ishmael was already cast out, and this blessing in their old age, to a specific mountain, slit his throat, and burn his body on an altar. Sorry for being so graphic, but sugar coating this would only hide the impact of the story. If someone were to come to me and tell me that God told them to kill a child of theirs and ask me if they should obey God, I would think they were schizophrenic. That is not the God I know. And I would be convinced of the mental illness, if they told me the details of how God wants it done. It is hard to continue this story without empathy for Isaac. His father, whom must really adore this almost only child, tells him to go on a journey to make a sacrifice to God. Isaac obediently obeys. Three days later, they arrive at the place with two of Abraham’s servants. You see, Abraham is really wealthy. I suppose the other servants were left behind. To add insult to injury, Abraham has Isaac carry the wood he is going to use to cremate his son. Isaac might be getting nervous or at least confused, at this point. They have everything they need for the sacrifice, the wood, the knife, and the fire. The only thing they lack is the lamb. Isaac is looking around and there is no lamb or any other animal to be used for the sacrifice. Abraham assures his only beloved son that God will provide. They arrive at the place God pointed out to Abraham. They build an altar. What this would involve would be piling up stones into a structure where an animal would be slaughtered and burned. Once the altar is constructed and wood placed on it, Abraham ties Isaac’s hands, likely behind his back and puts him on top of the wood, which is on top of the altar. 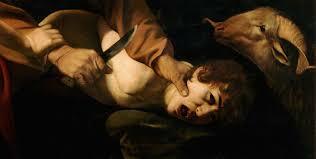 Abraham then takes out his knife and raises it to slit Isaac’s throat. I believe Abraham stalled during the construction of the altar. God must have a change of mind. When will God intervene? Just as the knife reached Isaac’s throat, an angel calls out, “Abraham, Abraham!” Abraham replied, “I’m here – I’m here!” There is urgency to stay Abraham’s hand, which I might add was at the last second. The angel told Abraham not to touch the boy. The test is over. Abraham’s faith is confirmed. The angel acts as God’s messenger to give Abraham his grade and to stop a horrible act. Instead of God saying, “I was only kidding,” God was satisfied that Abraham was worthy of being the progenitor of God’s people. This certainly questions God’s omniscience. But I think that human beings are way too unpredictable. A ram was caught in a thicket and Abraham offered the ram instead of Isaac, probably to Isaac’s great relief. I can’t help but wonder how Isaac felt about his father after that event. There was no such thing as psychology in those days, but how messed up would Isaac be after that trauma? Abraham names the mount, “God will provide.” Jewish tradition believes that this is place that Solomon built the temple. The place certainly has a tradition of sacrifice. Muslim tradition is that it is near the Kaaba in Mecca. Many scholars put the place near Shechem in northern Israel, which would have a symbolic connection to John’s story of Jesus encountering the woman at the well. In other words, we don’t know where Mount Moriah is. After the sacrifice is made, the promise of a multitude of descendants is once again repeated and it is added that the promise will be met now through Isaac. The Canaanites practiced child sacrifice. There were times when the Israelites also took up the practice. The prophets railed against them for doing so. They could argue that the Bible says that all first born belong to God, animal and human. But the Israelites engaged in child sacrifice because they adopted the Canaanite gods. It is hard to know if this story was meant to stop the practice of child sacrifice. This story is one of the stories read during the greatest liturgy of the church year, the Great Vigil of Easter. There are parallels with Jesus’ sacrifice for the sins of the whole world. Jesus is crucified not far from where Isaac would be sacrificed, if Jewish tradition is correct. Isaac carried the wood. Jesus carried his cross. Except, Jesus is not crucified by God. Jesus is crucified by pagans. Granted, Jesus willingly goes into their power, except their power turns out to be no power. Jesus didn’t stay dead. Back to the person I referenced earlier who believed that God wanted him or her to kill their child. We hear many voices in our lives, some internal and some external. The recent trial of the young woman who encouraged her friend to kill himself is a tragic example. How do we know what is from God or what is consistent with God? The answer is love. If what we are being asked to believe or to do is not consistent with love, then it is not from God. This is what Jesus commands us, to love. St. Paul wrote, “He who did not withhold his own Son, but gave him up for all of us, will he not with him also give us everything else?” (Romans 8:32) Jesus died on the cross for our sins out of love for us. That horrible act of violence was turned into one of love. Such is the power of God. The power of God’s love is greater than we can understand. Where we might see death, there is life. Where see despair, there is joy, or least a joy to come out of the situation. Abraham was promised countless descendants whom he would never see. God’s power of transformation is love. We show our love to others whom we never know through our gifts to our communities. We show our love in caring for one another. It is this power of love that will feed us and keep us whole. Negative thoughts, despair, feelings of giving up are not acts of love. Love is life. May you always be in a place of life. This entry was posted in Faith, Hope, love, Trust and tagged Hope, love, Sacrifice of Isaac. Bookmark the permalink.